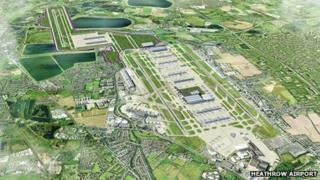 Heathrow Airport has unveiled three options for a new runway, saying each one would be "quicker and cheaper" than plans for a rival hub airport. The airport's submission to the Davies Commission, which is looking at raising airport capacity, outlined a runway to the north, north-west or south-west of the existing airport. 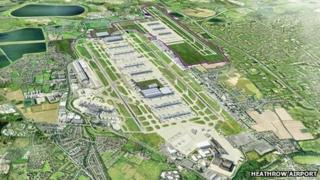 Residents, environmentalists and the London mayor oppose Heathrow's plans. Heathrow submitted its options to the government-appointed Airports Commission, headed by former Financial Services Authority chairman Sir Howard Davies. It is reviewing how the UK might expand its airport capacity in south-east England and interested parties have until Friday 19 July to submit their preferred options. The infrastructure project that would probably do more than others to stimulate growth would be building one or two additional runways at Heathrow. But, of course, almost the first action of the coalition government was to do the opposite, by shelving plans for the expansion of Heathrow. Ahead of submitting its proposals on Friday, Gatwick bosses said this week that they would prefer "a constellation system of three London airports - keeping Heathrow open, whilst building an additional runway at Gatwick, and then perhaps in time a new runway at Stansted". On Monday, Mayor of London Boris Johnson published proposals for three possible replacement hubs - an artificial island in the Thames Estuary dubbed "Boris Island", a major expansion at Stansted, or an airport at the Isle of Grain in north Kent. The commission is expected to recommend options by the end of this year, but will not submit its final report until summer 2015 - after the next general election. According to Heathrow's submission, building a new runway would deliver extra capacity at the airport by 2025-29 and would allow it to operate 740,000 flights a year - up from the current limit of 480,000. 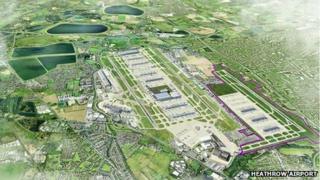 Heathrow's preferred option would be to place a new runway to the north-west or the south-west of the airport. This would "deliver a full-length third runway while minimising the impact on the local community". Stanwell Moor is a village near Heathrow and one of its councillors said it would "get completely destroyed" under one of the options. I've just been looking back through my notes from last year, when I talked to government officials about the prospect of building a third runway at Heathrow. They told me it was "dead and buried" and said they'd look at "all ideas bar a third runway". Back then we also had a Transport Secretary, Justine Greening, who lived under the flight path and had campaigned against the plan. What a difference to today, when a third runway at the UK's biggest and busiest airport is very much back on the table. This is a big week for airports. By Friday, we'll know all the different suggestions on how they could expand. But don't let all this apparent momentum fool you. This is one of the thorniest issues in politics, and there are plenty in the industry who think that 20 years from now, nothing will have actually been done. "I wasn't totally surprised because we knew these would be in the pipeline but it's a pretty desperate situation and pretty frightening," said Robert Evans. "The real problem now is the area is blighted and there will be a period of uncertainty; people will be anxious because they bought their homes and now they find the home isn't the asset they thought." Residents' group Heathrow Association for the Control of Aircraft Noise (Hacan) said it would fight any proposal for a new runway "tooth and nail". Hacan chairman John Stewart said it was difficult to square Heathrow's claim that expansion could take place while cutting noise for residents. Heathrow chief executive Colin Matthews said the UK "desperately needed a single hub airport with the capacity to provide the links to emerging economies which can boost UK jobs, GDP and trade". "It is clear the best solution for taxpayers, passengers and business is to build on the strength we already have at Heathrow," he said. Mr Matthews said he had not ruled out a fourth runway at Heathrow, but said this would not be needed until at least 2040. However, Mr Johnson said the proposals for a new runway at Heathrow "were politically, environmentally and socially unacceptable". "There will be more pigs flying than aircraft if we are to believe the claim that three runways at Heathrow will make less noise than two," he said. Media captionHeathrow Chief Executive Colin Matthews: "Uncertainty - that's the message I hear from people. They want to know"
Mr Johnson added the move "would be a disastrous outcome for Londoners, nor would it solve our aviation capacity crisis as a fourth runway would need to be in the planning process before a third was even open". Greenpeace accused the airport of presenting a "reheated and rehashed" plan with the same "flawed arguments that failed so categorically last time around". But business groups backed the plans, including the trade body which represents Britain's airlines. The Board of Airline Representatives said no other proposal so far on airport capacity could "deliver the UK's hub airport capacity quicker, at the right cost, or in the right place for airlines and their passengers".